We produce rare, raw unpasteurised honey from our own Surrey Bee Heaven Farm, and various London and UK city locations. Best prices too as most come in big 340g jars, not 250g like on other websites! 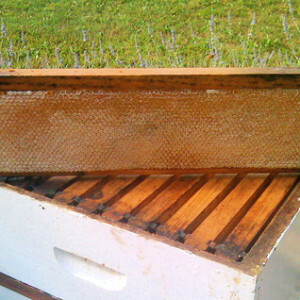 Supplied as a large whole frame just as it sits within a beehive. You get the entire wooden frame completely untouched as it was when lifted out of the beehive. Measures aprox. 45 cm long x 14cm wide x 3cm thick. Massive approx 1.7 to 1.9 kilos. This is from the Wildflowers in and around Surrey England. Harvested in June & August, fresh from the hive. A rich aroma, reminds customers of their childhood. Rarely seen in this entire comb form. TEXTURE: Set honey with natural crystalisation. We do not tamper or alter the natural composition of our honeycomb. We do not heat this either to change what our honeybees have done naturally. 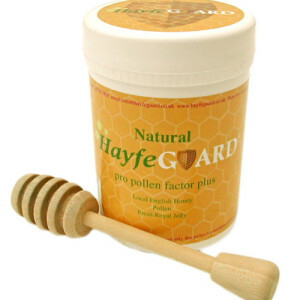 This ensures you receive this honeycomb as nature intended. Cut a bit at a time from the frame then wrap the frame with cling film and store in a cupboard. Will keep for years! Not suitable for children under the age of 24 months. One of my most prized honeys at the moment. I call it VIP because I had to give it a distinction from my other wildflower honey due to its extraordinary taste, colour and Very Important Plants. 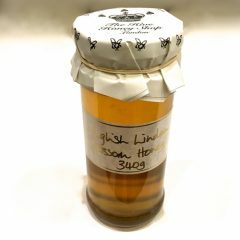 This won Best London Honey award two years running. 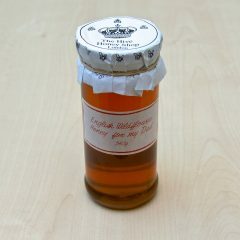 Great price for such a rare and distinctive honey. Gathered from 1000s of wildflowers in and around the Hampstead Heath, Finsbury Park area. Runny honey, medium dark in colour. Limited availability. This is such a special honey in its make up of various nectar tones. It has a warm gentle fig like clean taste. Not too sweet in its composition, aroma or flavour. One to try! From the many flowers of our Surrey apiary sites. Summer time is a busy time for our bees, gathering the rich nectars from the many wildflowers in the nearby woods and fields. Believe it or not there is an official honey colour grading system used at honey shows all over the UK. There are two glass colour grades to use to compare , light, medium, dark. The glass is placed against the side of the honey jar with a white background. The light glass is used to define the borderline between ‘light’ and ‘medium’ honey, a ‘light’ honey being one lighter than the light glass. The dark glass is used to define the borderline between a ‘medium’ and a ‘dark’ honey, a dark honey being darker than the dark glass. 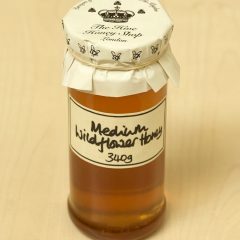 This honey is medium and tastes different from our light wildflower, so hence the name! 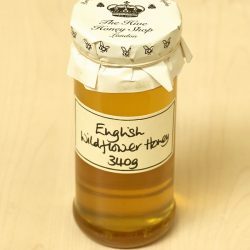 A runny honey with a medium, rich flavour. From the many flowers of our Surrey apiary sites. Spring time is a busy time for our bees, gathering the rich nectars from the many wildflowers in the nearby woods and fields. 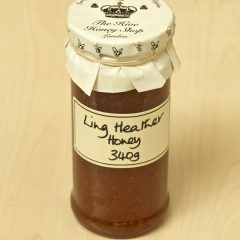 A runny honey with a light, delicate flavour. Back after a three year gap! Yes the British Linden (Lime) trees are fickle but well worth waiting for! Lots of hot weather meant the Linden blossoms dripped heavenly nectar and our bees worked fast to collect it. This is a light coloured honey with a tiny ting of green, bursting with handsome flavour. Not to be confused with Citrus Lime trees. 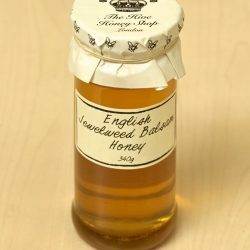 This honey stands out and is well worth a taste! Pale Light, Fragrant, Less Sweet Nectar. Clear, runny 340g . Must try while it lasts! Himalayan Balsam – Impatiens glandulifera is also known as Poor Man’s Orchid, Indian Touch-Me-Not, Pink Peril, Policeman’s Helmet, Ornamental Jewelweed. This genera Impatiens comes from Latin name which means impatient, referring to the explosive dispersal of seed. It is a highly invasive weed native to the Himalayan region of India found at an elevation of 4000 meters. It is thought to be naturalized throughout UK, most of Britain, Ireland, and little of British Isles. It is the tallest annual herb of British Flora, germinating from February to March. Flowering takes place from June to October and flowers produces nectar in a high quantity. Pollinating agents are Bumblebees, honeybees and wasps. Its height ranges from three to ten feet. Stems are thick, juicy, hollow, upright, purplish and tender, so they can break easily. Leaf arrangement is opposite, whorled and usually have three leaves on each node , these are simple and are oblong, ovate, elliptical in shape, size is about six inch long and half inch. Note we nor our beekeepers plant or nurture this wild plant. It grows wild and our bees simply somehow find it. 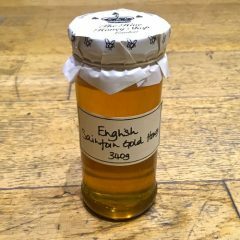 Gathered from the wild heather moors along the coastline on the Isle of Purbeck in Dorset England, with great hopes of gathering a crop of this magical honey as it can be a very fickle crop to obtain. Highly aromatic, with a full-bodied and distinctive flavour, a creamy butter like texture. This rare honey is of exceptional quality, and is highly sought by honey connoisseurs. A light, delicate bitter sweet taste with a creamy spreadable texture. Very popular with children. Gathered from the rolling meadows in and around the farm lands of Dorset. A delicious all-round honey. Serving Suggestions: On hot toast or crumpets, in teas or coffee as an alternative sweetener. FOR A LIMITED TIME! We had reduced the price to temp you to try this amazing honey. Bet you get hooked! Collected from the unique Red Clover of the Saliburys Plains area. It has a fresh piquant flavour. A light flavoured, pale yellow coloured honey. Rare honey- VERY hard to find. A must try honey- super surprise taste. Runny in texture. Highly prized! Very Rare!! 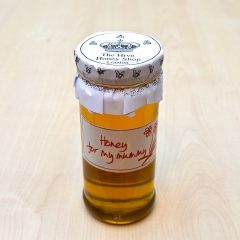 A fun label with our top quality runny English Wildflower Honey within. Let mum know you think she’s sweet! 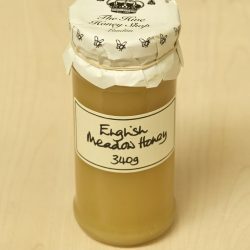 Great quality honey from our bees in Surrey. 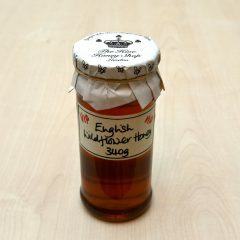 A fun label with our top quality runny English Wildflower Honey within. For the Dad that has everything, spoil him with a sweet reminder he’s well appreciated!